Lawmakers on both sides of a burgeoning debate over counterterrorism practices agree: Americans just don't know how carefully the government is monitoring their words and deeds in the name of national security. Revelations this week that the National Security Agency has culled hoards of "meta-data" from domestic phone records and international internet communications has alarmed civil libertarians in both parties, while more hawkish Democrats and Republicans have joined together to defend the NSA's practices. The one area on which both sides agree is that most Americans don't have a full sense of just how wide-sweeping the government's activities have been in its pursuit of national security threats. Arizona Sen. John McCain, a Republican defender of the programs, said Americans aren't aware of many of the government's anti-terrorist practices. "I don't think they know a lot of things that the government is doing in our effort [to counter terrorism]," he said Sunday on CNN. Sen. Mark Udall, D-Colo., a critic of the NSA methods who was aware of them as a member of the Senate's intelligence panel, said the same thing. "My main concern is Americans don't know the extent to which they are being surveilled," Udall said Sunday. The uproar over the NSA's practices has prompted renewed debate over what constraints should be placed upon the government in its intelligence and national security practices, more than a decade past the Sept. 11, 2001 terrorist attacks that led to the growth of most modern intelligence practices. Udall said Sunday on ABC that he would like for Congress to revisit the PATRIOT Act, the law first enacted under President George W. Bush that gives the government wider latitude in pursuing terror suspects. That law has been renewed under President Barack Obama, and it gives the government some of the powers detailed in this week's reporting about the NSA. Insisting that attempts at "100 percent security" will always come with inconveniences, Obama said "we're going to have to make some choices as a society." NBC's Pete Williams reports. "We hear this term 'meta-data,' which has to do with when you make calls, where you make calls to, who you're talking to," Udall said. "I think that's private information, and I think if the government is gathering that, the American people ought to know it, we ought to have a discussion about it, and frankly, I think we ought to reopen the Patriot Act and put some limits on the amount of data that the National Security Administration is collecting." Kentucky Sen. Rand Paul, a critic of many of the administration's national security practices and a Republicans with designs on the White House in 2016, suggested he might look to challenge the NSA snooping in court. "That is unconstitutional, it invades our privacy, and I'm going to be seeing if I can challenge this at a Supreme Court level," he said on "Fox News Sunday" of the NSA's collection of phone data. "I'm going to be asking all the internet providers and all of the phone companies — ask your customers to join me in a class action lawsuit. If we get 10 million Americans saying we don't want our phone records looked at, then maybe somebody will wake up and things will change in Washington." But defenders of the programs from both parties countered that the programs were carefully monitored already by both Congress and the courts, and struck a reasonable balance between civil liberties and pursuing terrorists. 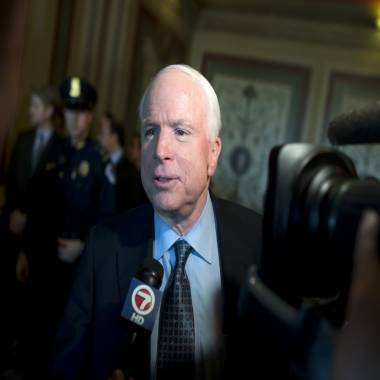 "It's a careful balance between individual liberties and responsibilities," McCain said. "I believe that the FISA court system is an appropriate way of reviewing some of these policies." And Sen. Dianne Feinstein, Calif., the Democratic chairwoman of the Senate Intelligence Committee, said she would seek ways to add more transparency to the government's anti-terror activities. "We have had lots of hearings on this," she said on ABC. "I'm open to doing a hearing every month, if that's necessary, and I'm open to doing an open [public] hearing." She added, though, that many of the counter-terrorism were so sensitive, that there would necessarily be limits to the extent which lawmakers can discuss these programs in public.